As autumn wind blows because it’s autumn, green leaf changes its clothes to red skirt and color the mountain and water red. While looking at beautifully colored autumn leaves and coloring your mind red as well, enjoy deepening romance of autumn in your closest space. 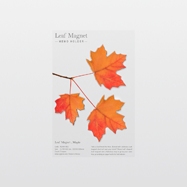 Realistically made cherry blossom-shaped magnet can be used for various places like partition, white board, refrigerator and etc and you can create the feeling of red-colored autumn leaf with it as interior prop.